Gwenfar's Garden and other musings: Gardening with ME: pressed flowers & foliage - a new gardening-related hobby? Gardening with ME: pressed flowers & foliage - a new gardening-related hobby? It started with a Tweet. 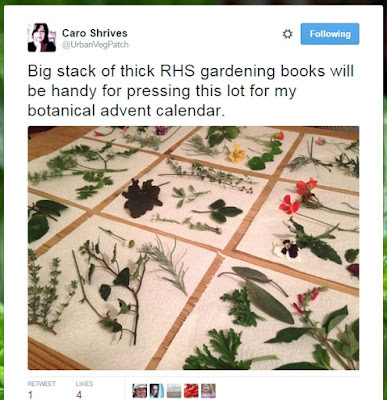 The above tweet in fact from Caro Shrives @UrbanVegPatch, last Saturday. Actually, it started before that even. In my last post I talked about having to face some hard facts about how much more I have to limit my gardening, as well as much else in my life, if I want to get well. Lots of rest is needed, for months, possibly longer. This leaves me with a dilemma - what do I do with all this 'resting time'? I'm not good at resting. Unlike some people with ME, I can still read and watch TV a bit, but there is only so much of that you can do before even that becomes boring and I get restless. I've been looking for a hobby for several months that is low energy use both physically and mentally, but was really struggling to find anything that appealed. Suggestions from friends included embroidery and knitting, but any kind of needle and I don't get along. Then last Sunday I saw the above tweet from Caro. Wow, that's pretty. I asked Caro a bit about the process of drying flowers and foliage. You can guess the next bit. A big light shone over my head and I saw that this might be something I could take on as a hobby. I loved what Caro was doing and it really appealed to me. I have plants, kitchen paper, heavy gardening books. It's GARDENING related. And it is fairly low energy use. I could do this. It would be an interesting way to capture the plants I grow and love. So, I have picked up a small scrap book to start with, and today I picked my first flowers and foliage. It was fun to take a gentle walk through the garden and it makes you look at plants from a different perspective. L-R: leaves of Florence Fennel, Geranium 'Ann Folkard', Clematis cirrhosa 'Freckles', Sage leaves, leaves of Potentilla 'Monarchs Velvet' and Salvia guaranitica 'Blue Enigma'. Being late in the year they are a little past their best, but this is just to start with and see how I go. I've placed the leaves on paper towels and put these in the bottom book below. I then stacked all the others on top. They are drying on the lounge window sill as it's quite warm and dry, so hopefully a good environment for pressing flowers and foliage. I need to check them every couple of days and change the paper towel if needed. You need to get all the moisture out. Apparently it can take 10 days to 2 weeks for them to dry. I've ordered some gummed linen tape, as suggested by Caro, and will use that to stick them into my scrapbook when the dried leaves and flowers are ready. So, now it's waiting time. I'll let you know how it goes. In the meantime, I'll do a bit more resting. What a wonderful idea for you and as you say, it's garden related! I can imagine you having all sorts of plants drying under your stacks of RHS books!